In preparation for a week of drawing, walking and cycling across the islands of the Outer Hebrides in early April, Mike headed across to the Brecon Beacons National Park. 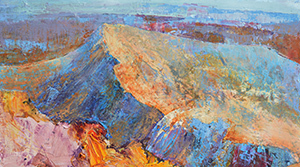 The view from below the peak of Pen y Fan westwards to Cribyn was stunning and was the inspiration for this new painting. 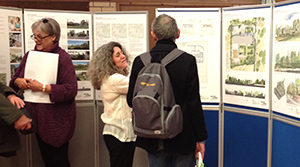 Watercolour plans, sections and perspectives were used yesterday to explain proposals for a care home in Oxford. The images helped bring to life the design of the building by Walters and Cohen Architects and its Ibbotson Studios garden setting. The building would be elegantly integrated with its landscape context, with a lower level sunken courtyard and access to green roof terraces. Torrential rain over the last 2 weeks has flooded the Cotswold landscape. The valley of the River Leach above Eastleach (illustrated) is normally completely dry, but vast lakes have formed filling the valley bottom, reflecting the sky and hillsides and emphasising the shapes of the valley landform. 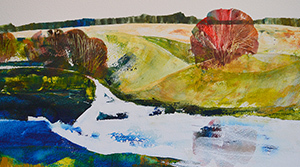 Mike is adding paintings to the portfolio illustrating this dramatic transformation of the Cotswold valleys. 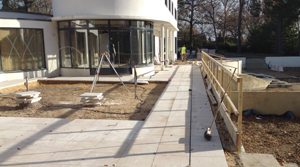 Paving has commenced on the raised garden terraces transforming the spaces around the house. 500mm square honed Jura limestone units have been combined with a narrow slot drain for a sleek finish. We selected a matching pair of stunning semi-mature fasigiate Pin Oak (Quercus palustris Green Pillar) for a prime position framing the front elevation of the house in a garden design project in Surrey. 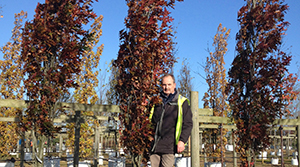 Autumn colour was at its peak in the nursery and the leaves of these oaks had turned a claret red. We also picked 16 matching Great White Cherries (Prunus Tai Haku) which will form the enclosure around the rectangular rear lawn and also checked the condition of another batch of reserved trees destined for a garden on the Wentworth Estate. All were in superb condition under the care of our friends at Barcham trees who had brought in hand-picked stock from Italy 18 months earlier. Mike was asked to return to the Department of Architecture to deliver an illustrated talk about his recent project experience to the MSc students undertaking the Conservation of Historic Gardens and Cultural Landscapes. This included works restoring the park and creating new gardens at C18th Williamstrip Hall in Gloucestershire through to making a new garden for an early C20th Modern house by architect Oliver Hill (one of Mike’s favourite buildings is the Midland Hotel by Oliver Hill). A book based on the programme of this course is being edited by course leader Dr Marion Harney and is due to be published next year by Wiley-Blackwell. Mike contributed a chapter to the book related to practical and contractual problems on site.